Rhodes' history begins long ago in the mist of mythology. According to the myth, Zeus decided to apportion the islands of Greece to the other Gods. The Sun God Helios selected Rhodes, while it emerged from the azure blue sea, flooded it with his eternal light and made it the most beautiful island. Helios named the island after the nymph Rhode, with whom he felt in love. She was the daughter of the Goddess Aphrodite. From the Stone Age Rhodes has been invaded and influenced to a greater or lesser degree by many eastern Mediterranean civilizations, including the Minions (1700-1600 BC), coming from Crete, Telchines Heliades, Phoenicians, Archeans and Dorians under the leader Tlepolemos, who according to tradition shared the island between the three cities of Kamiros, Ialissos and Lindos in 1100 BC. In about 700 BC those three cities, together with the island of Kos and the cities of Cnidus and Halicarnassus on the coast of Asia Minor, founded the Dorian Hexapolis, and alliance which was called the Pentapolis, when Halicarnassus with drew from it. This alliance or amphictyony survived until 408 BC. The three ancient city states of the island, united and concentrated their power into a new settlement, a new city state was founded - Rhodes. It was build from the plans of Hippododammos from Milos. 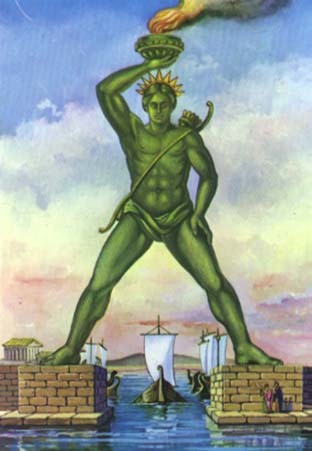 The statue of the Colossus, which was 31 metre high, one of the seven wonders of the world, standing over the harbour of Rhodes. It was built from Charis of Lindos and was destroyed in 226 BC by a violent earthquake. During this period, Rhodes became an important naval power where art and literature fourished. Their activities in trade and in the founding of colonies were unparalleled for the time. The fast Rhodian ships sailed to almost every corner of the Mediterranean, bringing home wealth and glory. In order to ensure that navigation was properly ordered, the Rhodians introduced a system of international maritime law which was one of the most important early legal texts and was still used through the Roman period and down Byzantine times. 356 - 323 BC was the time of Alexander the Great. 42 BC Cassius destroyed and plundered the island. 3 BC Rhodes was a major centre of learning, attracting young people from over the known world. Distinguished Romans such as Cicero, Julius Caesar, Pompey and others studied rhetoric and philosophy in the famous school in Rhodes. In 50 AD the Apostle Paulus made Rhodes a significant Christian centre and later it became part of the Byzantine empire. 620 AD the Persians conquered Rhodes and in 623 AD the Caracens. 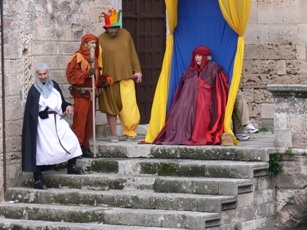 1082 Venice was granted the right to establish naval base on Rhodes. In 1246 the island was conquered by Genoans who essentially ruled it until 1309 when the Knights Hospitaller St.Johns invaded the island. 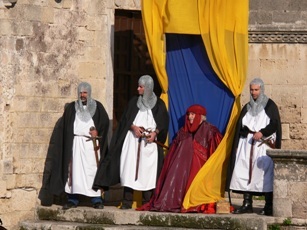 After acquiring Rhodes, the Knights ruled it as an independent state and for more than two centuries, they where the scourge of Muslims in the Eastern Mediterranean. On 23.12.1522, Villers de I'Isle Adam, the last Grand Master, was forced to surrender the city to Suleiman the Magnificent, who decided that the Christian spearhead must be broken. The Turks stayed until 1912. In 1912 during the Turk - Italian war, Rhodes fell under Italian occupation. Under the Allies Peace Treaty in 1947, Rhodes, together with the other islands in the Dodecanese, was awarded unity with the rest of Greece.